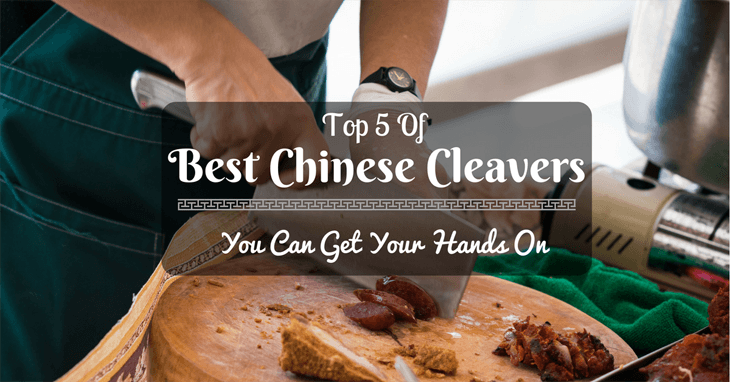 What is Chinese Cleaver Best At?Why You Need It In Your Kitchen?1. Sharp Edge2. Crushing Surface3. Grab and Transfer Food Efficiently4. Blunt Reverse Edge5. Full-Tang Knife6. Flat Round Bottom of HandleShould You Have One in Your Kitchen? What is Chinese Cleaver Best At? A Chinese cleaver, as the name implies, seems to be a very specific kitchen tool for a particular kitchen task. But is it? The sheer size of the cleaver itself can be intimidating. It’s like a butcher’s knife with a straight spine and thinner blade. But what is this Chinese cleaver craze all about? To start with, they are a versatile kitchen cutlery once you get accustomed and appreciate what they can a do. Why You Need It In Your Kitchen? Can you imagine the many uses of a Chinese cleaver? If you can’t, let me share with you some of the practical features of this awesome knife. The sharp edge can efficiently cut through thick slabs of meat and some bones. The long blade can facilitate a deep and precise incision on whatever meat you are cutting. You can also use it to slice and dice fruits and vegetables. It too would be an easy task for the cleaver. 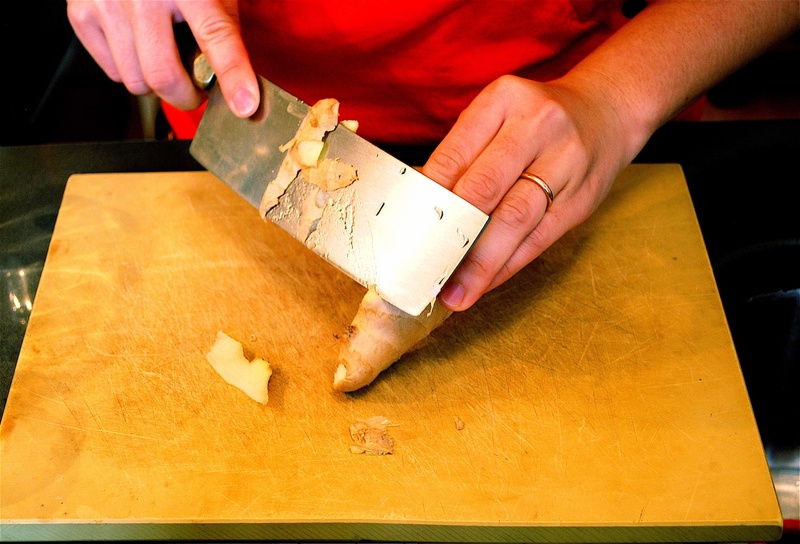 Some knives featuring curved blades can easily roll on the scooping board mincing garlic, onions, and ginger. This wide surface is an excellent feature of this knife to smash or crush garlic, ginger, and other kitchen ingredients that you want to be flattened. This same wide surface of the knife is something you will fall in love with. In one scoop, the wide surface can be enough to carry what you chopped to your cooking pan. This may be a small feature but it convenience can is useful! The opposite straight blunt edge of the knife can be used to gently hammer steaks and other meat to tenderize them. You can also use it to crack a broken television if you dare! Let me give you a short explanation if you are not familiar with a tang. Full-tang means that your knife spans from the tip of the blade to the base of the handle. Your knife is a one-piece steel from the pointy edge to the blunt bottom. 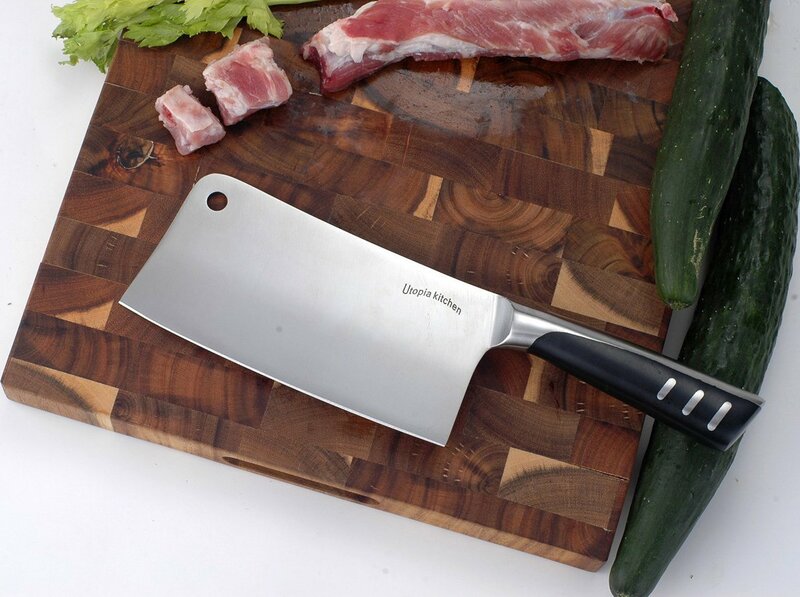 The handle is fashioned with wooden material that will fit comfortably fit your hand while slicing and chopping. This makes your Chinese cleaver sturdy and durable. Can this knife be more useful than what has listed above? The flat round end of the handle can also be used to crush seeds and spices. You can use it like how you use a normal pestle. It’s hard to say that a Chinese cleaver is the only knife you need. You would find it awkwardly trying to peel with a cleaver. The same way that a chef’s knife is not suitable for cutting through bone! So, should you have one at home? 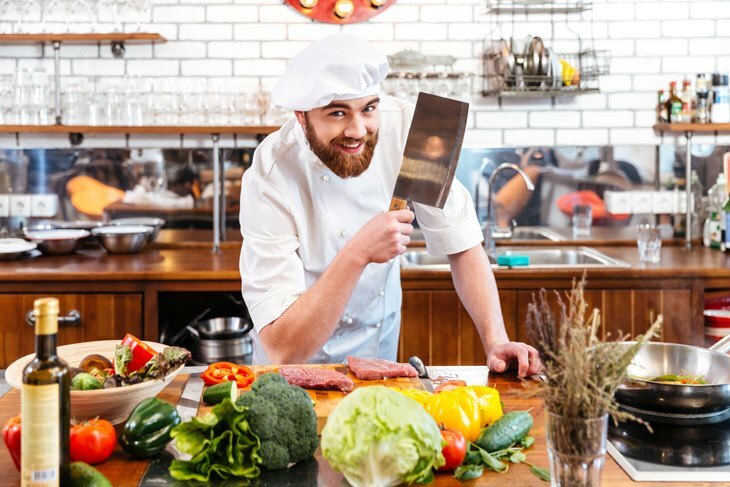 Well, if you want to make things comfortable in the kitchen, I believe a cleaver can do a lot to make your life easier when cooking. Cleavers are meant to be used with a massive beating. They can chop through bones and slice through tough kitchen ingredients. 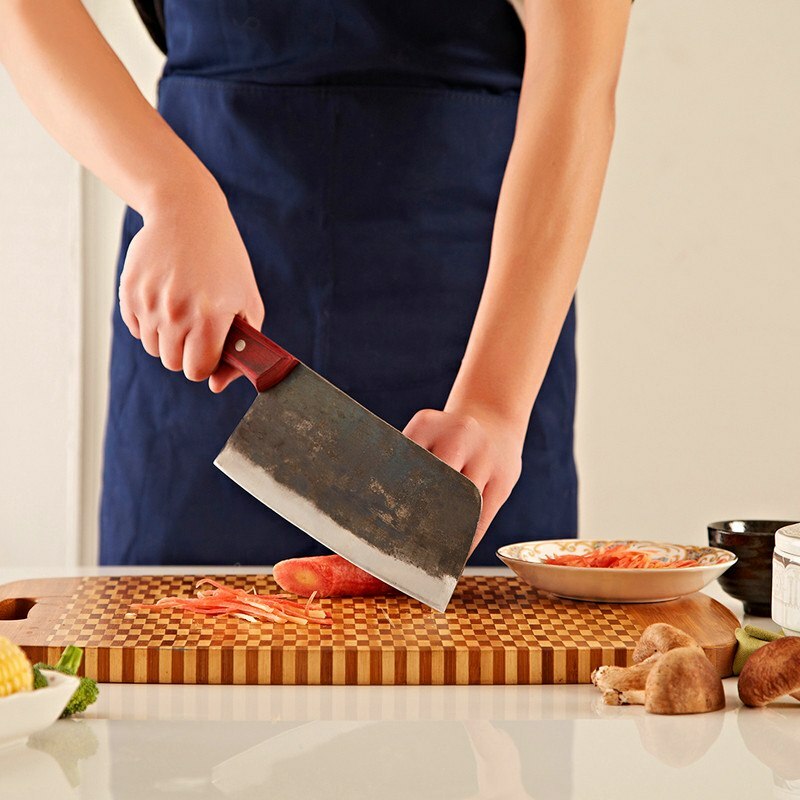 Make sure that you get a suitable chopping board that can also take a beating. 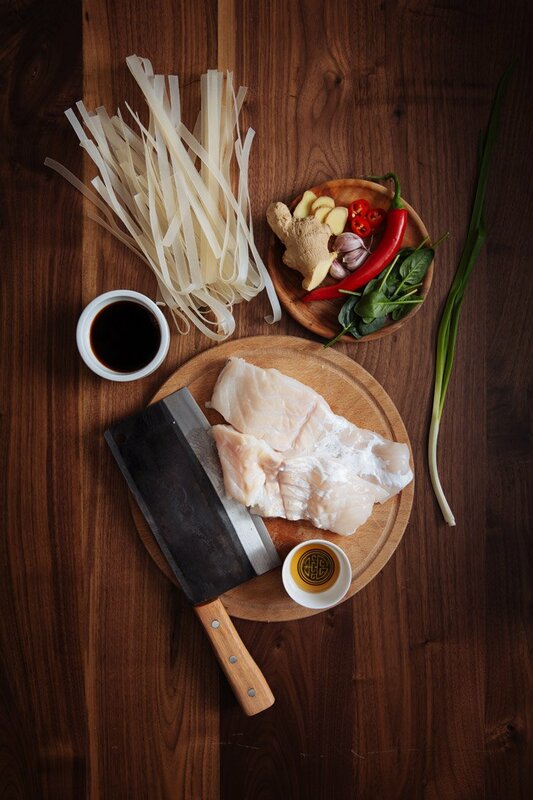 You might just end up breaking ordinary chopping boards when using your Chinese cleaver. Also, since it is meant to be abused and cut hard ingredients, you will also need a whetstone available anytime to sharpen your knife. This knife is made of a corrosion resistant stainless steel with a wooden flat wooden handle. It is easy to grip and would not rotate while you are using it. It has an eight-inch-long blade and a handle that spans five inches. Full Tang - The blade itself feels robust and does not bend easily. The tang spans from the tip tot the base of the handle. You can whack things with it without worrying about breaking! Easily Cuts Veggies- If you are cutting and slicing vegetables for your recipe, you will not get a problem with this knife. You can rely on it that it will get the job done effortlessly in the littlest time! Flat Handle- The handles are made of flat wood embedded with the tang. You can be sure that the blade would not rotate for every whack you make. Curved Spine - When using a cleaver to whack and split things in half, it is advisable to use the heel of the blade to avoid damaging and cutting with maximum force. With the curved spine design, you can use any part of the blade to split things without worrying about destroying your knife. Light - For some beginners, this may be an advantage rather than a drawback. But for experienced users, the weight of a cleaver is used to help you cut deep in every hack. 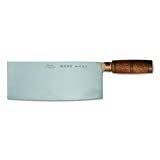 Often Needs Sharpening - If you are not heavily relying on your cleaver, you will be okay with it. 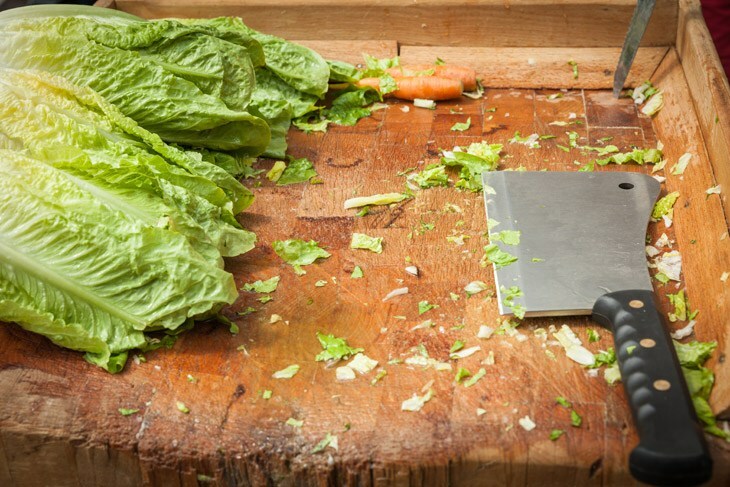 If you cut too many things with it in your kitchen, you may need to sharpen it frequently. This knife closely resembles the western version of butcher’s knife. Though it can cut through softer animal bones, it is designed to cut and mince vegetables effortlessly. 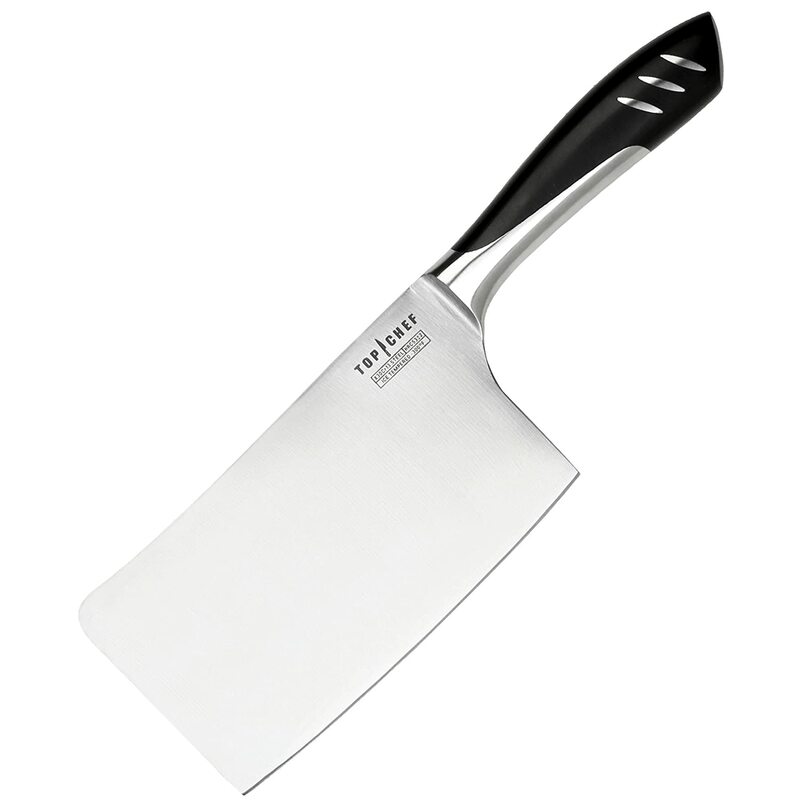 The large surface of this cleaver facilitates scooping of chopped ingredients to your pot. Carbon Steel Material - This knife is made of the sturdy carbon steel. You can relentlessly chop onion, mince garlic, crush ginger, and even cut through bones without worrying if you will break it! Straight Spine - If you love steak, this knife can help you tenderize meat with its spine! Using the reverse of the sharp end, gently give your steak a message. Season it and prepare an amazing sumptuous dinner! Rosewood Handles - The company chose Rosewood for the handle of this knife. Well, what can I say? They fashioned this knife with a sturdy wood. With proper care and maintenance, you can handover this to your grandchild! 3 ¼ inch Blade Surface - This issue may not be for everyone. But if you are preparing large batches of meals for a large family or an event, you may find yourself frequently scooping the ingredients as it cannot gather everything at once. Pricey - This may come pricey for some people. But the quality speaks for itself. Awesome products come with a high price. A Little Unbalanced - The handle seems to be a little short for the whole length of the blade. The blade draws a heavier downward force making it a little difficult to lift and aim. This can be easily negated if the handle is a little heavier. This knife features a seamlessly bonded stainless handle to the blade. The stainless handle is bolstered with a non-slip handle for ease of use and trimmed black accent. It has a classic straight spine and slightly curved blade. This 7” chopper/cleaver has an effective blade length of 6.5”. A laser inscription of Top Chef is located on the upper right corner of the blade. Doesn’t this give you a confident vibe that you are one of the contestants? Confident Brand - This brand is carried and used by the tv program. You can rely on them that they are of top quality! Otherwise, they would not vouch for it over national TV! Sturdy - The thought that the blade and the handle are fused may give you the impression of it being weak. But it’s not! It has some weight to it which adds to its sturdiness. Feel free to hack chicken bones with ease. Textured Non-Slip Grip - With a non-slip handle, you can hack everything in the kitchen at your heart's content with confidence that you will not accidentally let go of your cleaver. Go ahead and dice those veggies! Dishwasher Safe - After a tiring day of cooking, isn’t it easier to just dump everything in the dishwasher and leave it there? You can safely place this knife inside your dishwasher and tidy it up when it’s done. Heavy - Depending on how much you work out, the weight can be your friend when preparing meat in the kitchen. If you don’t work out much, and for some petite women out there, this may be downright heavy for you. Narrow Handle - On average, the handle can be workable. But if you have big hands, this may be a little thin for you. The thin handle can sabotage your grip and can be dangerous to work with. Utopia made this knife from high carbon stainless steel. 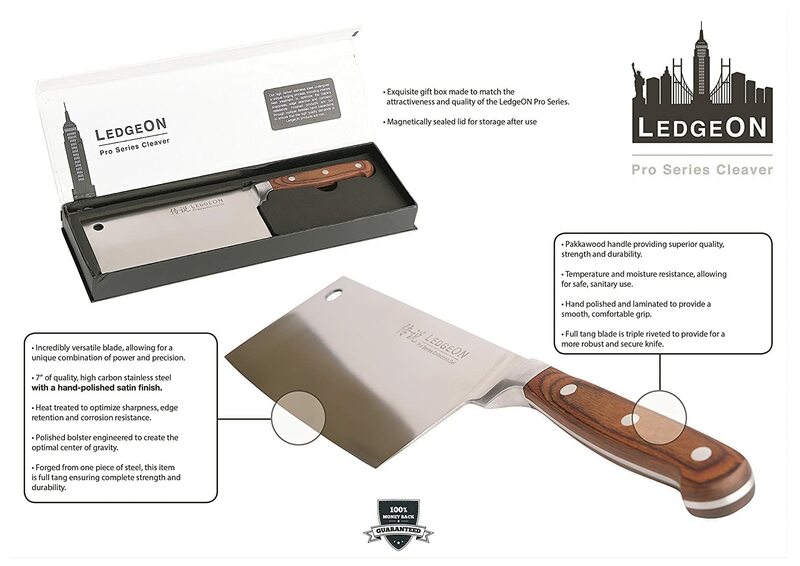 They want to make sure that their knife is high quality and can compete with the top brands. This knife is also designed with a curved spine to support you in your heavy duty slicing and hacking needs! Lifetime Warranty - This company is confident enough to grant their clients with a lifetime warranty. They will replace your knife if it is deemed that it had failed their quality check. Balanced - For accuracy, the blade is balanced from both ends. You can confidently and cut precisely with this knife. Slice large fruits evenly with ease using this knife. Ergonomic Handle - The design of the handle is well thought of. The stainless handle fused to the blade ergonomically fits the hands of the user with ease and comfort. Slippery Handle - If you are working on greasy kitchen stuff, make sure that you wash or wipe your hands thoroughly. You don’t want to accidentally let go of a knife while separating bones and joints. Loses Sharpness - It’s good for whacking but has some difficulties when slicing. The weight can pull you through thick slabs of meat with a good force. It easily loses its sharpness even with a wooden chopping board. Not Dishwasher Friendly - Well, it may not be a big deal to wash a knife. But on some occasions, you’d rather sleep than wash the dishes, right? The Pro in Pro Series is something LedgeON lives on. They make quality, durable knives. 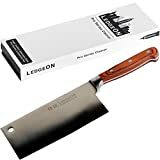 This particular knife, a 7” cleaver is a great tool in your kitchen. It’s made of a high carbon corrosion resistant material that lasts a lifetime when properly cleaned and stored. Full Tang - Knowing that the knife spans from tip to base gives you a feeling that you can rely on your edge. You can dice veggies, cut open coconut, and split bones and joints using this knife. Tapered Bolster - Notice how the handle tapers where it meets the blade? This feature makes it easier to grip this knife and handle it four hours without strain. It has a subtle contour and sturdy grip. Bordering Thin Handle - If you got small hands, this could be a great choice for you. But, again, if you have large hands and long fingers, you might find the handle a little thing for you. This can significantly affect your grip. A Little Pricey - It is a great equipment. The quality is good. If you don’t mind paying the price, this is a good kitchen tool to add in your arsenal. Looking for the best Chinese cleaver is can be a little tricky. Particularly for those who have just started exploring the wonderful world of their kitchen. There are a few things you may want to consider before buying a cleaver because they are not made all the same. Some features allow you to use the handle as a pestle and crush some peppercorn with it. Some other feature a fused handle and blade. This is a matter of psychological security. As for me, I can work better with a full tang knife. I feel more secured that I am still holding on to the extended part of the blade. The weight of the knife is something worth considering too. Depending on how you intend to use them, cleavers may come heavy or too light for you! I hope I have managed to help you decide which of these Chinese cleavers is the one for you. Feel free to share this with your foodie friends as they might also want to buy one! If you want to explain something, don’t hesitate to leave a question below. I will get back on you soon.